Clinched it a game earlier in 2008, giving us a day off to enjoy it and seeing if the Mets or Brewers will take the Wild Card and we can think about who we get next. Mets lost their Shea finale, the Brewers are the Wild Card and our NLDS opponents. Cubs, best record in NL, get the Dodgers. In the AL, the Angels with the best record in MLB get the Red Sox and the White Sox play the Rays. 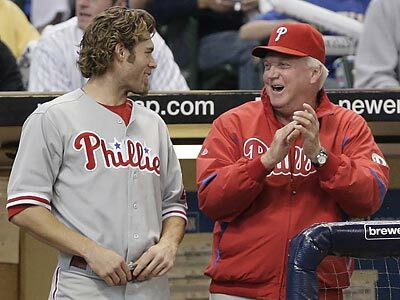 Our announced rotation will be Hamels, Myers, Moyer and Blanton. Reports are that Happ will be on the postseason roster and Seanez will not. Another off day until NLDS starts tomorrow. 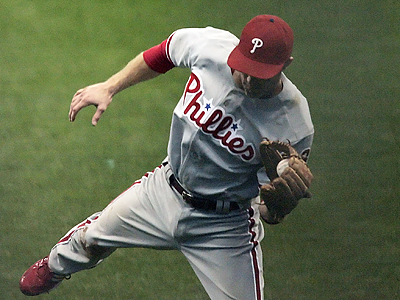 Brad Lidge was named the 2008 Comeback Player of the Year in the NL. Phils announce roster for the NLDS, Eaton and Seanez not on it, Happ and Taguchi are. Time for Game One! Looking for first postseason win since the 1993 World Series. 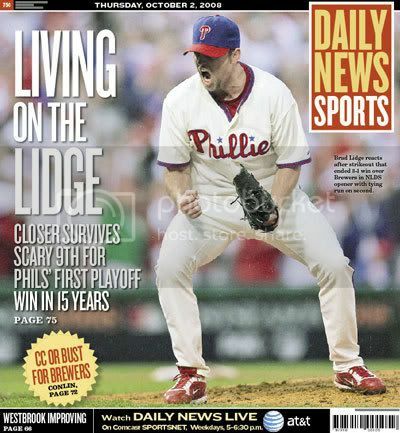 Hamels in control, Lidge gave us some thrills but nailed it down, Phils up 1-0 in NLDS. Left-handers that throw hard, especially when Victorino makes the pitcher bring the ball down, he can have strong games at times. Elsewhere, it's Biden vs Palin in the VP debate. Do you mind if I call you Joe? I was there. Yes, indeed, a hair-raising ninth inning. But, nice to see the first postseason win in 15 years! 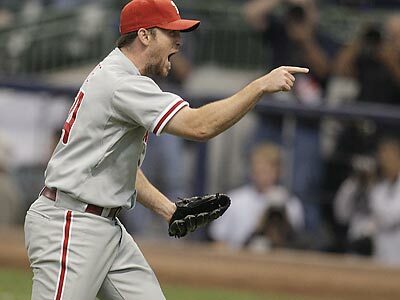 Will Lidge run out of gas this postseason? Huge couple of games in Philly, now all we do is wait for Game 3 in Milwaukee tomorrow. 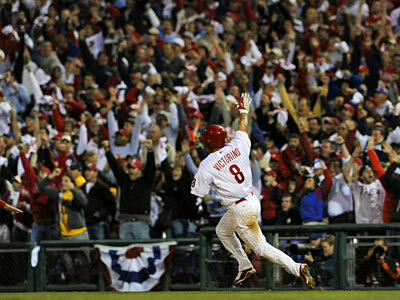 That pic of Victorino rounding first, right arm raised, has been my computer wallpaper for years. I was there that night & will never forget the roar when that ball cleared the fence. After 7 previous failures, the Brewers beat the Phillies. 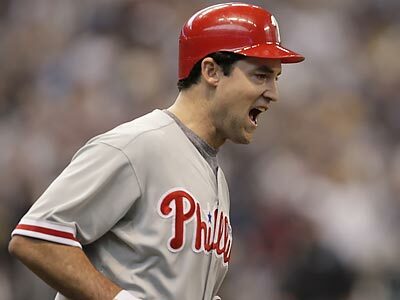 Now up in the series 2-1, Phils have the chance to get their first ever NLDS series win. Time to see if the Joe Blanton trade can pay off a little more in the postseason. Eagles are playing at the same time. I wonder which game will get more eyeballs in Philadelphia. 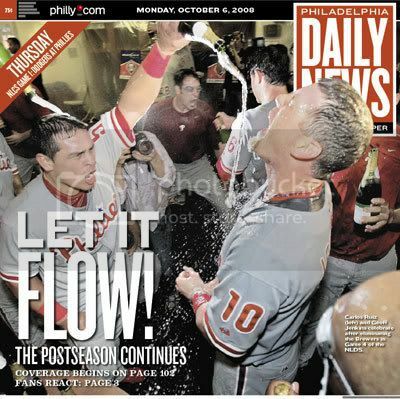 And, how will CSN (n/k/a NBC Sports Philadelphia) handle the Post-Game Live shows? Elsewhere, the Dodgers upset the favored Cubs. The Cubs midseason pickup Rich Harden didn't pitch well. CC Sabathia, the Brewers big pickup, did K as a PH for them yesterday. The Dodgers big pickup, Manny Ramirez, awaits us in the NLCS. But we'll have to wait a bit for that. To follow up on my post from yesterday, the Phillies and Eagles games ended around the same time. As a result, CSN had a simultaneous Post-Game Live show going with the network constantly jumping back and forth between the two teams and panels. At various points, we had Mitch Williams commenting on the Eagles and Ed Rendell, Vaughan Hebron and Ray Didinger commenting on the Phillies! Waiting for the NLCS to start. 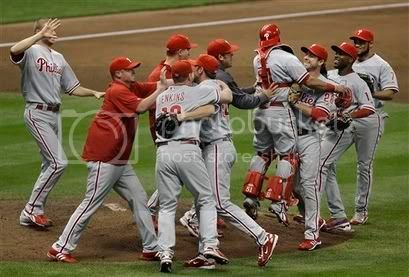 We do have time to debate if the Phils celebrated too much in Milwaukee. ESPN picks LA for the most part, most have us losing in 7. Rob Neyer has us winning in 7. It's funny I actually don't remember exactly what's going to happen in Games 1 and 2 (4 and 5 I remember rather well). Oh, now it's coming to me. I can picture the hotel room in which I watched Game 1. Still waiting on the NLCS. Reports are they are considering Rudy Seanez over JA Happ on the roster. To this day, I wonder why teams do the whole locker room celebration thing after winning the DS (and, I suppose, the WC game). I can understand doing so for making the postseason, winning the pennant and, of course, the WS but partying hard after the DS always strikes me as a little much. 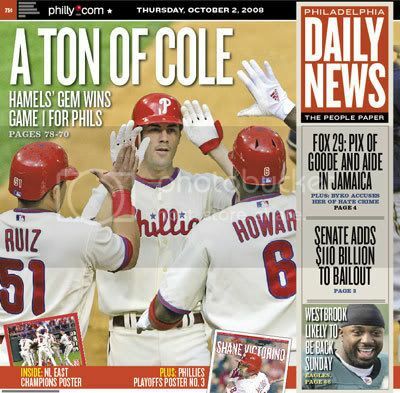 It was a big deal for the '08 team after losing in '07. I assume the celebrations become more muted once you've done it for the first time. But there are always new players.And they don't get hammered the way people did in 1980 (or maybe even '93). I bet when they first introduced the NLCS people wondered if that should be celebrated, since until 1969 the "pennant" meant you won the regular season and were already going to the World Series (no division titles either).